1. Preheat a panini press or a large cast iron skillet or griddle over medium heat. Lay bread, open side up, on a work surface and spread the bottom and top halves with mustard. Layer bottom and top halves with Swiss cheese. Working only on bottom halves, layer on all of the pickles, ham, roast pork, and salami (if using). Close sandwiches, pressing gently. 2. Butter top and bottom of panini press and press sandwiches with moderate pressure until crisp on both sides, about 8 minutes. If using a cast iron skillet or griddle, melt half of butter in pan and add sandwiches. Use a second pan to press on them as the first side crisps. When crisp, flip sandwiches, add remaining butter, swirl to coat, and continue cooking while pressing until crisp on both sides, about 10 minutes total. Slice sandwiches in half diagonally and serve immediately. Cuban bread is a soft white bread made with lard. Look for it in Latin bakeries or groceries. If unavailable, use any not-too-crusty, soft white rolls, preferably with some lard or fat baked into them. Salami is a traditional ingredient in Tampa-style Cuban sandwiches, but can be omitted. 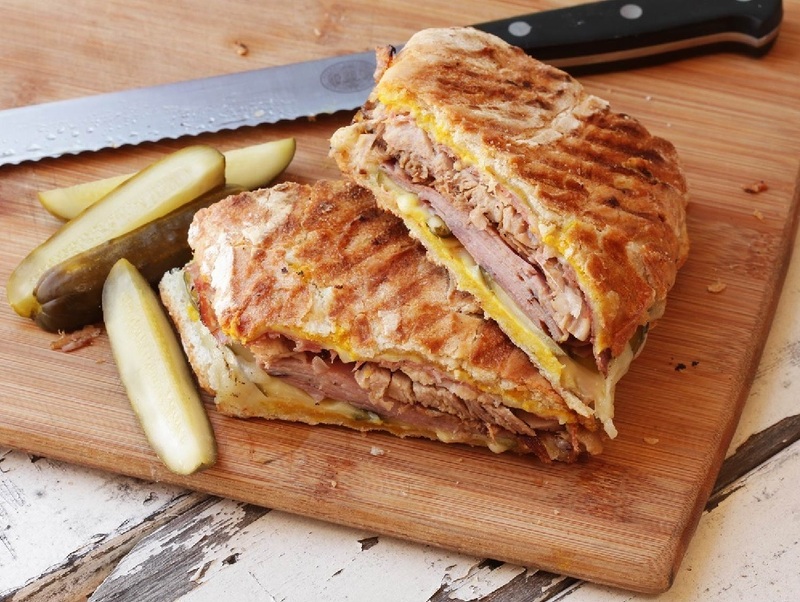 CLICK HERE for a step-by-step, and very entertaining, description of how to make a Cubano. As I mentioned above, Izeta Cordero, the heroine of UNDER THE ASSASSIN’S MOON, is half Cuban and was raised by her grandparents. Even though she’s a CIA operative, in the quiet times beween assignments when she’s curled up at home on the Outer Banks, Zeta would definitely make herself a Cubano. And trust me, Brody thinks these hit the spot. They can even make them when they’re motoring around on The Moonstruck. You only have to wait one more week to read their story. Just click on the cover to pre-order it now from Amazon! Do you have a favorite warm sandwich? If so, share with the rest of us! This entry was posted in Writing Life and tagged books, characters, food, fun travel and adventure, links, Moonstruck, new release, recipe, series, Tuesday Treats, writing. Bookmark the permalink. I use my Foreman Grill to make sandwiches a lot. I made some the other night. Rotisserie chicken sliced, thick ham slices, Swiss cheese. Kinda like a Cordon Bleu thing. Yum. I’ve also used leftover steak and leftover bratwurst. The usual is just cheese and lunchmeat, though. Still pretty good stuff.